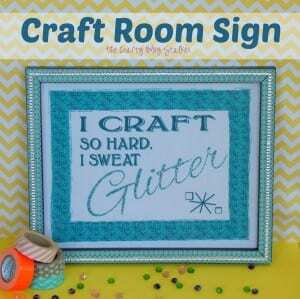 A fun home decor sign for your craft room made with fabric from Modern Yardage. 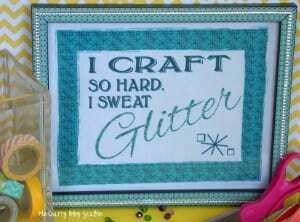 I craft so hard, I sweat glitter. Make fun wall art. I absolutely love my new sign for my craft room. Actually, would this be called a sign or a plaque? Either way, I absolutely love it! In my SWAG bag from SNAP! I got this awesome fabric panel from Modern Yardage. I thought this looked like a fun little project so I set out to see what I could do with it. 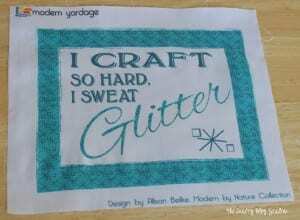 For starters, I wanted the word glitter to actually glitter. I had some silver glitter glue on hand and used a paintbrush to add the glitter to the word glitter so it would glitter. — Sorry, I couldn’t help myself. While the fabric was drying I went to work on the frame. I got a cheap 8×10 frame and used Gemz and Washi Tape that I already had on hand. 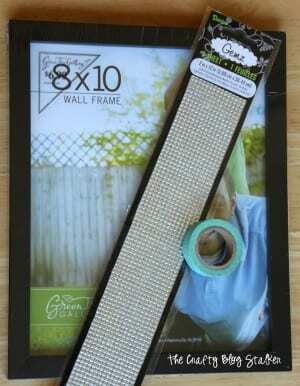 Using the Washi Tape , I went around all four sides of the frame. In the corner, I used a craft knife and trimmed the tape at an angle so the corners would match up. The frame needed more glitter as well so I used some Gemz. The best thing about the Gemz is that you can cut them into strips or whatever you need. I cut strips, and since the back is sticky, I stuck it directly to the frame. When I was done with the frame the glitter glue was dried so I put it all together. Hi Katie, HaHa!!! You crafty little fairie You!!! It’s so cute and so clever!!! !Have a great crafty week!!! This sign is hilarious – I love it! Hopped over from Sugar Bee Crafts! This made me laugh – love it! This quote is awesome!!! I’m your newest follower! 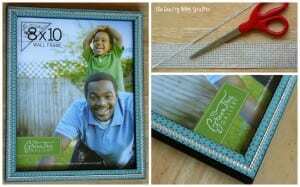 I love how you added washi tape to the frame! I love washi tape! Thanks for sharing at Show-Licious Craft & Recipe Party!